The newest version of the Jaguar F-Type is not that new at all. It’s called the Chequered Flag, and although it comes with fancy trim bits like a ‘black pack’, sports seats, 20-inch wheels and some chequered flag logos, it’s mechanically identical to any other F-Type. And also a little more expensive - the V6 version is £72,715, nearly £6000 more than a P380 R-Dynamic. So, after driving one at Jaguar’s Fen End Experience Centre, I’m going to take this opportunity to reflect on the F-Type as whole, rather than review the Chequered Flag. It’s now been with us for seven years, after all. Yep, it really is that old, the convertible emerging in 2012, with the CX-16 concept that previewed the F having arrived a year before. The coupe arrived in 2014, and in 2016, the range was completed with the especially shouty SVR. 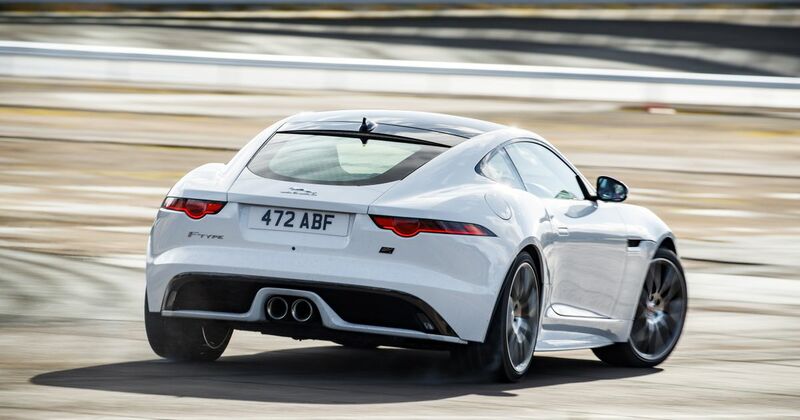 As Jaguar’s first sports car since the E-Type, expectations were high. But I’m not sure it’s ever met them - not entirely. 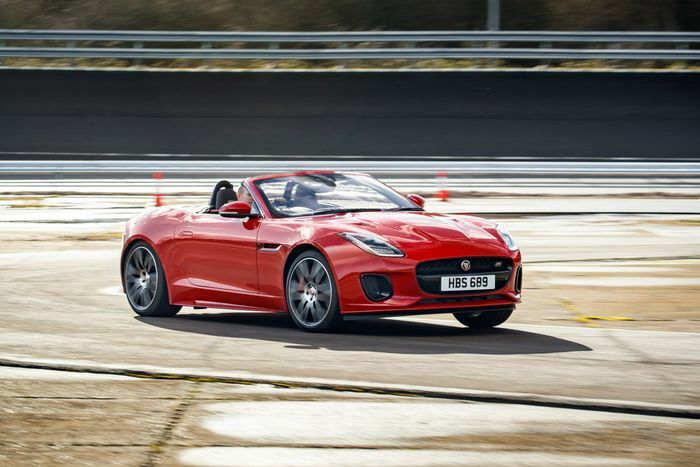 If judged as a sports car, the F-Type falls short. It has that weirdly fast and light steering that’s at odds with a front end that’s not as willing to tuck in as you’d like. The damping has never been as resolved as rival cars, and with the heaviest versions tipping the scales at well over 1700kg, the F-Type is not exactly a featherweight. 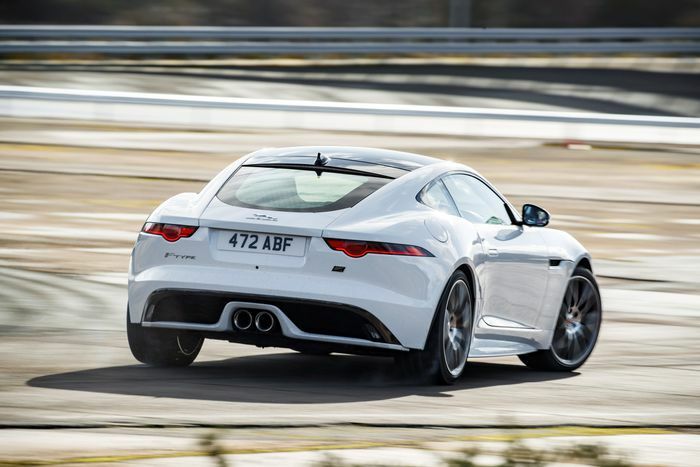 Drive one on track, and you’d swear the F-Type is heavier still. Sure, you can get a 2.0-litre version that’s happier with fast changes of direction thanks to a 52kg weight drop on the nose, but it’s still not quite there dynamically, and one of these with an inline-four just seems a bit wrong, doesn’t it? Adding a manual didn’t really help matters much, either. On paper, the idea of a stick F-Type seems amazing, but the reality is the shift isn’t hugely satisfying, and the clutch action is far too springy. You’re better off sticking with the eight-speed auto, something the vast majority of buyers have done. So if it’s not a sports car, what is it? Comfortable though it is, you only have to pop the boot - particularly the convertible’s - to realise it’s not really a grand tourer either. Perhaps, then, it’s a muscle car - the sadly departed rear-wheel drive R could certainly be described thusly. Or perhaps it’s the closest thing you can get to a modern TVR without waiting for the new one, which doesn’t appear to be happening any time soon. However you want to label it, though, the F-Type is fun. Hilarious, old-school fun. Even the all-wheel drive version will happily slide, as it demonstrated during my drive at Fen End’s handling course. The rear-drive V6 S remains the sweet spot of the range, though. We’re so used to turbocharged engines now that the supercharged six-cylinder can at times feel breathless, but its linear power delivery makes on and beyond-the-limit handling disarmingly easy. And you really can’t argue with that soundtrack, which mixes supercharger whine with an anti-social howl from those drainpipe-spec exhausts. Even if you’re not sliding about (and let’s be honest, legal opportunities for such antics are few and far between), driving an F-Type is always a real experience, and one that makes you forgive the dynamic foibles, and the weirdly tiny cabin. And when you’re done, you can get out, and spend a good few minutes just looking at it. The visual impact it had upon release has waned somewhat over the years, but it’s still one of the prettiest cars on sale right now. The F-Type is set to continue pretty much as it is now, with the angry V6s and V8s to be retained to 2020 at least and most likely beyond. And that’s just fine by me. 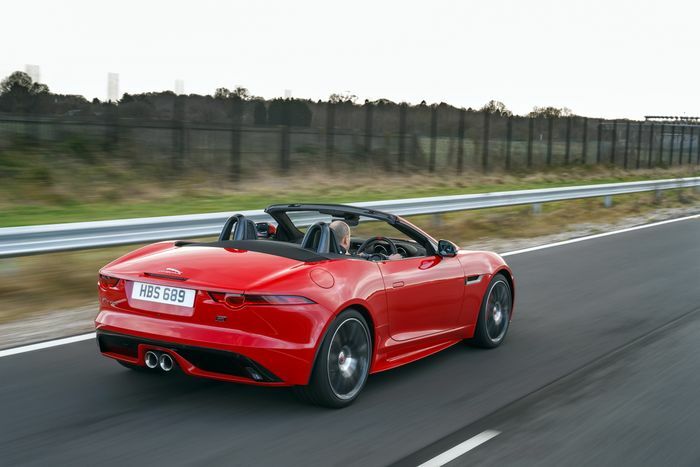 The F-Type hasn’t turned out to be the car we expected, but I’m glad Jaguar made it. A sports car it is not, but that doesn’t stop me loving it.